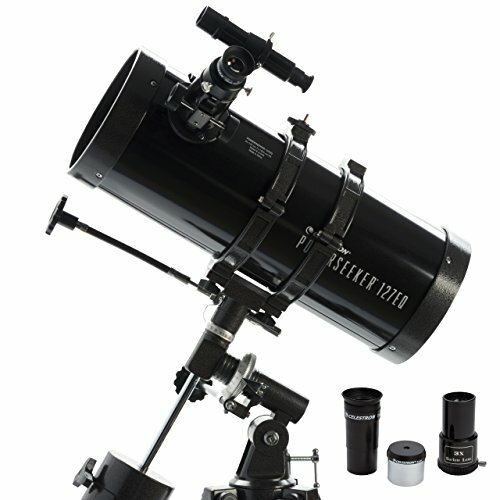 The Price: You will struggle to find a similar beginner telescope at this price point among other major brands, including Meade Instruments. No-tool Setup: This is astronomy made simple! Remove the telescope and tripod from the box, attach two pieces, and you are ready to insert one of the eyepieces to begin viewing. ”The Sky” Planetary Software: This software is perfect for beginners and includes over 10,000 objects, as well as 75 color illustrations and skyline views. The Tripod construction: The adjustment screws are made with cheaper material that will wear over time with the continuous use of the unit. The combined weight of the telescope and the mounting system may cause the tripod to become less stable when the legs are fully extended. The Weight: The weight of this beginner telescope, along with the German Equatorial mount and tripod, comes in at 17 pounds. This is noticeably heavier than telescopes with similar optics, such as the Meade Instruments LightBridge Mini 130 telescope. The Internal Mirror: Part of the price point of this telescope is the use of a spherical mirror instead of the more expensive parabolic mirror. Aberrations that are created with this type of mirror are corrected by a lens at the bottom of the focuser. This lens makes it difficult to collimate properly if needed once your telescope arrives. Note that collimation is required for reflector telescopes on a periodic basis. The Celestron 127EQ PowerSeeker Telescope is an entry-level instrument designed to get you set up in the field and ready to view celestial objects quickly. The reflector design is more compact than a refractor style telescope would be at the same size. The German Equatorial Mount is designed with controls that offer slow-motion movement that produces smoother tracking of objects as they move through the night sky. The 127EQ comes with two eyepieces (a 20mm at 50 x magnification and a 4mm at 250 x magnification) as well as a 3 x Barlow Lens that triples the magnification power of each eyepiece. Who is The 127EQ PowerSeeker Suited For? This beginner telescope is aimed at those who are new to amateur astronomy as well as casual observers. Requiring no tools to set up, the 127EQ PowerSeeker’s simple design will deliver great viewing for the entire family. The included software is designed to allow you to locate and identify objects of interest. Celestron has been manufacturing telescopes since 1960. The company entrenched themselves in the market by mass producing inexpensive Schmidt-Cassegrain telescopes in the famous matte orange colored tube. In amateur astronomy, Celestron (as well as Meade) represent the best known and trusted names for telescope manufacturing. The company offers a two-year limited warranty on their telescopes.